High quality furnishing combined with SAT TV and a hifi system makes the living room a cosy wellness oasis. The modern built-in kitchen is equipped with an electronic stove, oven, microwave, fridge with freezer, coffee machine and toaster. In the cellar you will find a washing machine, dryer and iron. The apartment is equipped with 2 bedrooms and offers space for 2-4 people. For families with small children, there is also a high chair and crib available. Through the typical Frisian walls and the plants on it with wild roses, the sun terrace is protected from views and wind - here you will find garden furniture, 2 loungers and a beach basket. A parking space is also located on the property in front of the holiday home. Our holiday domicile is located at one of the most beautiful points on the island, far from hectic on the outer edge of Wyk - at the end of a dead-end street in a preferred location between an old golf course and green. It is only 400 m to the southern beach with the unique view to Hallig Langeneß and to Amrum. The inner city of Wyk can be reached on foot in 20 minutes along the beach promenade. In the sea water wave pool 'aqua Wyk' you can go swimming and enjoy the sauna when ever you please. Comfortable and spacious furnishing in our apartments, some over two floors, contribute to your well-being. Particularly the details give our holiday domiciles a special flair. All apartments are equipped with two bedrooms each and are made for 2 to 5 people. Our most important goal is the relaxation of our guests and this can be easily summarised: arrive - relax - be at home. aquaWyk-Föhr: Health and zest for life in a spa for the whole family. Awaiting you: sea water wave pool with outdoor pool, kiddie pool, large slide and whirlpool, Thalasso and wellness centre, sauna facilities and the fitness centre aqua-Fit - all under the roof of the aquaWyk-Föhr. Information for your arrival: The green island is connected to the mainland with a ferry connection. You can park your car in Dagebüll on a guarded parking lot/garage for a fee. If you would like to bring your car on the island, we ask you to please reserve a ferry space in time through the Wyk steam ship shipping company under the telephone number 0180 - 5080140 or over the internet site. On the terrace or in the garden you will find a beach basket belonging to the apartment. Second SAT-TV in the sleeping area. Föhr is the second largest of the North Sea islands with 9000 residents. The Eiland is located in the middle of the Schleswig-Holstein Mudflat National Park and is 7 km away from the mainland. 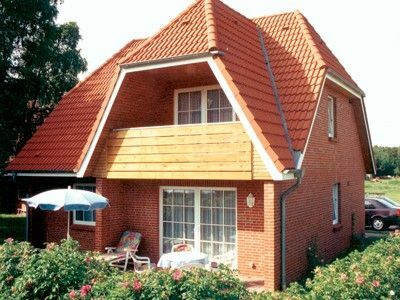 Wyk on Föhr has been a federally recognized North Sea healing resort since 1950 and can look back at more than 175 years of tradition. The small, sophisticated harbour city is the centre of the island and offers all amenities of a modern resort. In addition to the capitol Wyk, there are 16 more villages whose typical Frisian character has remained preserved with a lot of cosy thatched roof houses. The east and south coast offer a 15 km long, stunning fine-sand beach, while a safe sea dike protects the land and people in the west and north. Golf: 18 hole course from the golf club Föhr e.V. 1 km away. Surrounded by rose bushes and forest, the course was built in 1926 and is one of the most beautiful golf courses in northern Germany. The golf course was expanded in 2008 by 9 holes and can be played year-round with 27 holes starting in the middle of 2009. The club house is also open during the winter months.